Annie Dookhan served three years in prison and was paroled in April 2016. 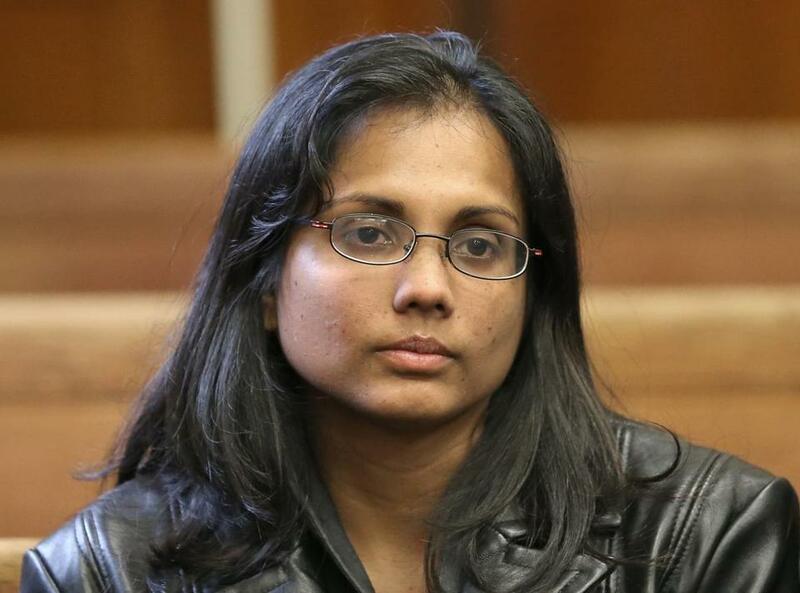 Prosecutors across the state on Tuesday said they would collectively throw out more than 20,000 cases that relied on evidence handled by a disgraced drug lab chemist, Annie Dookhan. The dramatic step, which specialists called unprecedented in scope, follows years of litigation by defendants whose cases involved evidence that was analyzed by Dookhan, who pleaded guilty to tampering with drug samples and fabricating results. The submission of the final list of cases to be dismissed offers the fullest accounting to date of the disruption caused by a scandal that came to light in 2012. But Michael O’Keefe, district attorney for the Cape and Islands, said that even though his office would dismiss cases “because we believe that the integrity of our system of justice is more important than their conviction,” no conclusions about guilt or innocence should be drawn. “We are dealing with drug defendants, the overwhelming majority of whom plead guilty, went through an exhaustive plea colloquy with a judge and testified under oath that they were ‘pleading guilty because they were guilty and for no other reason,’ ” O’Keefe said in a statement. Lawyers representing the defendants said Tuesday that they did not believe anyone is still incarcerated in a Dookhan-related case. The state and defense attorneys will now work to ensure that all of the affected defendants will be notified. In January, the Massachusetts Supreme Judicial Court gave district attorneys 90 days to come up with a list of cases that should be dismissed because they could not hold up without the potentially tainted evidence. The seven district attorney offices with cases affected by Dookhan — Bristol, Essex, Cape & Islands, Middlesex, Norfolk, Plymouth, and Suffolk — brought their respective lists to the SJC clerk’s office in Boston on Tuesday. Suffolk County had the most, with about 7,800 defendants whose cases would be dismissed. The SJC is expected to issue an order of dismissal this week. Dookhan was responsible for testing drugs in about 40,000 cases from 2003 to 2012 at the former Hinton laboratory in Jamaica Plain. She served three years in prison for evidence tampering and was released on parole in April 2016. Prosecutors had already dropped many cases on their own initiative or by order of special courts created to hear Dookhan-related appeals. But fewer than 2,000 cases had been resolved with those methods, according to public defenders. The SJC determined that the “extraordinary magnitude” of Dookhan’s tampering demanded that district attorneys do more to address potential due process violations for thousands more defendants. “We’re thrilled to say today that it looks like 95 percent of those tainted drug convictions will be dismissed,” said Carl Williams, an attorney with the American Civil Liberties Union of Massachusetts, whose clients’ lawsuit led to the SJC ruling, at a press conference at the John Adams Courthouse. Prosecutors from each office also submitted lists of 320 cases that will not be dropped. “An employee as disloyal as Dookhan to scientific integrity never should have been allowed to work in a laboratory, and the laboratory should have had the oversight and protocols in place to prevent her fraud — or at least caught it in a timely manner,” she said. The 90-day deadline imposed by the SJC on the district attorneys posed a considerable challenge to evaluate so many cases, prosecutors said. “We have worked hard to strike a balance between maintaining the integrity of the system and protecting public safety in many of these cases,” said Bristol County District Attorney Thomas Quinn in a statement. Quinn’s office will dismiss more than 1,500 Dookhan cases, and certified that it had independent evidence to maintain another 112 convictions. The lists of dismissed cases will not be publicly available because they contain protected information, according to the Committee for Public Counsel Services, the state’s public defender agency. CPCS has created a hot line for defendants to check the status of their cases. “Many, many people will wonder if their own old conviction is being dismissed, but will not be able to look through lists online,” wrote Nancy T. Bennett of CPCS in an e-mail to defense attorneys last week. It may take weeks for defendants’ criminal records to reflect their dismissals. Courthouse clerks around the state must update each individual trial record, including by manually revising paper dockets. The state probation department must revise its own database case by case. Many defendants are unsure how their records will be affected. Robert Neundorf, for instance, pleaded guilty to multiple counts of possession with intent to distribute marijuana and other drugs in 2012, just as Dookhan’s tampering was hitting the news. He learned earlier this year that some of his samples had crossed Dookhan’s bench. But he is unsure whether all the related charges will be vacated at once, since he entered a single guilty plea. Neundorf said he has faced difficulties in his executive sales career because of his felony record. He said his first step is to ascertain whether he is on the list of cases to be thrown out. The district attorneys’ submission of their lists of cases to dismiss and which cases will stand triggered a second deadline: Dookhan defendants whose cases will remain on the books must be notified within 30 days. Defendants whose charges have been dismissed must also be notified. District attorneys, CPCS, and the ACLU have been tackling the logistics of reaching so many defendants. Proposed methods include delivering notices via certified mail and starting a social media campaign. The litigation over Dookhan cases may not be complete, either. gmail.com. Reporting for this story was supported by the Fund for Investigative Journalism.